Marcel Kittel of Etixx – Quick-Step made it two in a row by winning Stage 3 from Nijmegen to Arnhem, preceding the Italians Elia Viviani of Team Sky and Giacomo Nizzolo of Trek – Segafredo in the bunch gallop. 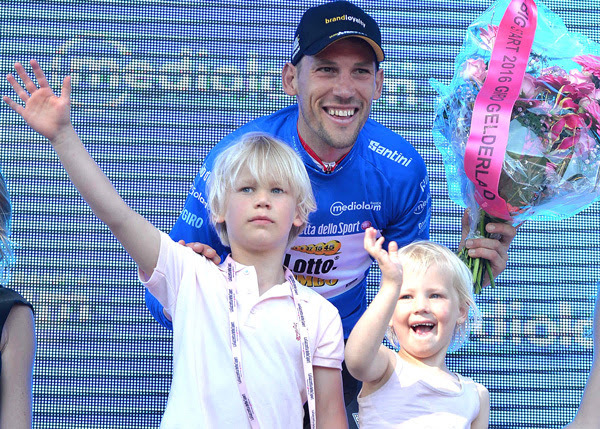 The German sprinter also took the first Maglia Rosa of his career. The Dutch authorities and local organizing committee counted over half a million roadside spectators in the three days that the Giro d’Italia spent in the province of Gelderland. 30,000 attended today’s start in Nijmegen, 60,000 attended the stage finish in Arnhem and 165,000 crowded the race route. The long breakaway of the day was formed of Julen Amezqueta (Willier Triestina – Southeast), Johann van Zyl (Team Dimension Data), Giacomo Berlato (Nippo – Vini Fantini) and Maarten Tjallingii (Team Lotto NL – Jumbo). Berlato and Tjallingii were both in yesterday’s long breakaway from Arnhem to Nijmegen. The quartet achieved its maximum lead of 8’10” at km 68. Jean-Christophe Péraud of AG2R-La Mondiale crashed on a roundabout leaving the village of Borculo (km 86). The runner-up in the 2014 Tour de France became the first rider to abandon the 99th Giro d’Italia. Tjallingii took the lead in the King of the Mountains competition by cresting the only categorized climb of Stage 3 at Posbank (km 134) in first position. Van Zyl forged on with 11km to go. He built a lead over the chasing peloton of almost one minute but he was brought back with 1.7km to go as the sprinters teams closed in on the stage finish. Marcel Kittel: “My plan for the Giro is to take the race goal by goal. My first goal was to do well in the time trial. My second goal was to win two sprint stages. Now I’ll fly to Italy with the pink jersey, it’s a great honour. I’m proud of what I’ve achieved in these first three days. As a sprinter I want to be the fastest. I’ve managed to be the one because of the great support of my team and the excellent condition I have. The number of spectators who have attended the event and the way I’ve won these two sprints make my Dutch experience of the Giro a very enjoyable one”. King of the Mountains Maarten Tjallingii: “Talking about my breakaway yesterday, I said this morning it was once in a lifetime but it became twice in a lifetime. And the atmosphere along the road was even better today than yesterday. This is my home crowd. I live in Arnhem and we passed 200 metres away from my house. To have the Giro d’Italia here in Gelderland is a gift for me. I knew there was a possibility to take the King of the Mountains jersey if I made the breakaway again. The legs were a bit sore from yesterday but my morale was extremely high. I’m glad I’ll wear the blue jersey in Italy”.